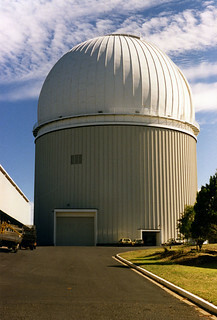 Anglo-Australian Telescope dome, Siding Spring. Back when I was studying for a Ph.D., my work involved occasional trips to the Anglo-Australian Telescope at Siding Spring, in the modest mountains west of the small town of Coonabarabran. My supervisor and I would drive up from Sydney, something like five hours on the road. At the observatory, you settle into a jetlagged routine of staying awake all night, falling asleep at dawn for a few hours, and having breakfast around the time normal people are having lunch before spending the afternoon looking at the data collected during the night before starting all over again. Thankfully this routine only ever lasted three or four nights at a time, because observing time on the 3.9 metre optical telescope (then one of the largest in the world) was doled out in small chunks to different, highly competitive science proposals. Analysing four nights of data could easily fill the six to twelve months before you got a chance to collect any more. My targets were quasars, which are incredibly bright galaxies, but so incredibly far away that from Earth they look like extremely dim stars. Not that you can see any with your naked eye - they are so faint that a fairly large telescope is required. The faintness of these objects means you can only observe them when the sky is at its very darkest. From about an hour after the sun goes down, to about an hour before it rises the next morning. And only when there is no moon in the sky. So even after the sun had gone down, we'd still be getting ready to observe. One time I went to the observatory, I was accompanied by a fellow Ph.D. student from the University of Sydney. Her name was Vikki Meadows. She had her own project and observing plans. For my project, I needed to use the telescope for the entirety of each night, from the end of evening twilight when the sky got dark, right through to the start of morning twilight when it became too bright to observe my quasars. So what was Ms Meadows doing? She used the telescope from about 4pm, up until a little bit after sunset, when I would take over. But the sky is too bright then to see faint stars. And what can you possibly observe when the sun is up? To us it's Friday, named after the Norse goddess Frigg, the wife of Odin and called the "beloved one". But to the Ancient Romans, it was dies Veneris, the day of Venus, goddess of love. In Italian it is still called venerdi, in Spanish viernes, and in French vendredi. Several other things are named after Venus, including a genus of clams, almost certainly so named by Carolus Linnaeus in 1758 because of the association of clam shells with the mythical birth of the eponymous goddess. One of the most iconic images of Venus depicts precisely this scene, as painted by Sandro Botticelli in 1486: the Birth of Venus as a fully formed goddess, floating to shore standing on a giant clam shell. Venus depicted on a clam shell. 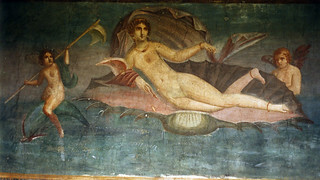 Wall fresco, Pompeii. The Romans also associated Venus with one of the mysterious wandering stars, or planets, of the night sky. Being the goddess of love, they chose to grant her name to the most brilliant planet, one which outshines all the other planets and all the other stars in the night sky. Because it orbits more closely to the sun than does Earth, it always appears in the neighbourhood of the sun in our sky, though not constrained to be quite so near as Mercury. This means Venus is seen hanging low in the sky, either just after sunset or just before dawn, depending on its current orbital position. Venus is so bright that it is one of the only "stars" visible at these times, when the sky is still fairly bright. 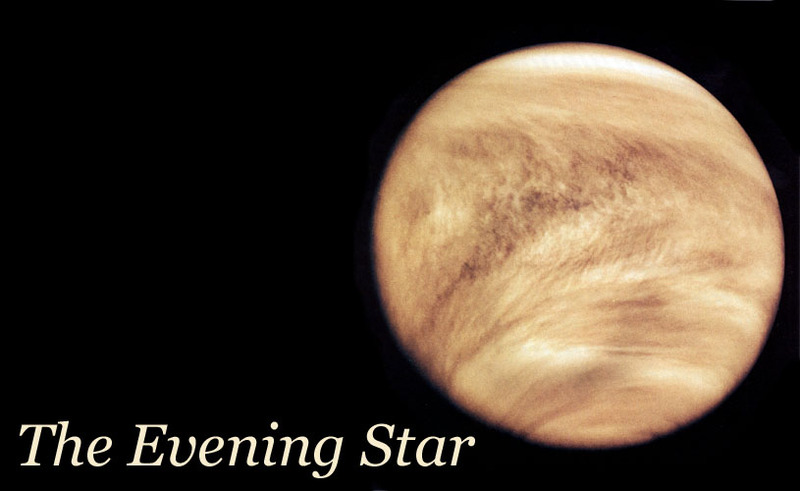 For this reason, Venus is also known as both the "evening star" and the "morning star". In fact, Venus is so bright that you can see it in full daylight, when the sun is in the sky, if you know where to look. It's not much brighter than the blue sky around it, so it's tricky to spot, even if you have a rough idea where it is. But it's easy enough to pinpoint it if you start by observing Venus around sunset, sighting it from a specific location and lining it up with, say, a set of power lines. Return to the same spot each day a few minutes earlier - Venus will be a little higher in the sky. Use the power lines to direct your gaze up until you find it. Repeat this over a few days, a bit earlier each day, and get used to how far Venus moves each day. As the sky becomes brighter each day it will be harder to spot the planet, but if you persist you will eventually have a sightline defined by those power lines that will let you spot Venus while the sun is still in the sky. Your reward will vanish in a few weeks as Venus moves around the sun, but you can do it again another time, including around dawn. Venus from Mariner 10. Public Domain image by NASA. You've probably worked out the connection by now. My fellow student, Ms Meadows was observing Venus. Point a large telescope at Venus, and even in broad daylight you can capture useful data. When I was a school kid, I wanted to grow up and study planets, like Carl Sagan. I got to study astronomy at university, but nobody in the Astronomy or Astrophysics departments there studied planets. So instead of studying some of the smallest and closest objects that astronomy concerns itself with, I studied quasars, pretty much the largest and farthest objects we know of. Vikki was... luckier. She got into the postgraduate program via a collaboration with the Anglo-Australian Observatory and NASA's Jet Propulsion Laboratory in Pasadena, California. Her base in Sydney gave her the opportunity to use our great Australian telescope to study Venus. By the time we were observing together, we knew quite a bit about Venus. But back when I was at school, watching Carl Sagan on television, we didn't know so much. Unlike the other planets close to Earth—Mercury and Mars—Venus is covered with clouds. Thick, white clouds that hide the entire surface of the planet, and never go away. This is part of why Venus is so bright in our sky. These gleaming clouds reflect much of the sunlight that hits Venus, and the reflected light sears down out of our sky. So even though Giovanni Schiaparelli and Eugène Antoniadi could observe Mercury through early telescopes in the years around 1900 and produce maps of surface features on that planet, as late as the 1970s we had no idea what any of the surface features of Venus looked like. The first efforts at penetrating the obscuring clouds of Venus began in 1961, using radar imaging from NASA's Goldstone Observatory. The giant radio dishes beamed a string of radio pulses at Venus when it was close to Earth, and recorded the radio signals bounced back. This was a crude method that could only reveal very large patches of different radar reflectivity on the surface of Venus. Two such places were identified in 1964 - regions which reflected radar more strongly than the rest of the planet. For lack of any further clue as to their physical nature, they were both simply named using the Latin word for "region", prefixes by the first letter of the Greek alphabet: Alpha Regio and Beta Regio. Observations of these regions finally allowed astronomers to figure out one of the most basic facts about Venus: how fast it rotated. It turns out that Venus has a very unusual rotation. Unlike every other planet in our solar system, Venus rotates in the opposite direction to its orbital revolution about the sun. It also rotates very slowly—much slower than any other planet—taking 243 Earth days to spin around once. Another mystery about Venus was solved in 1962. A few years earlier, in 1956, a team led by C. Mayer of the US Naval Research Laboratory observed Venus with a microwave receiver. In results published in 1958, they found that the microwave radiation emitted by Venus indicated that the planet had a high temperature. An extremely high temperature. Around 600K (330°C or 620°F) - hotter than most domestic ovens can reach. This finding was so unexpected and surprising that most astronomers didn't think it could be the surface temperature of the planet. The reading must be coming from a hot layer high in the atmosphere instead. Radar map of Venus by Magellan. Public Domain image by NASA. But in 1962 NASA launched the Mariner 2 probe, which became the first spacecraft in history to successfully encounter another planet. It passed by Venus in December of that year and, among other observations, measured the temperature of the planet using both microwave and infrared sensors. Both instruments confirmed that the temperature of the planet was close to what Mayer had measured six years earlier. It was still theoretically possible that only the cloud layer was this hot, but the evidence now made it much more likely that the surface shared this extreme temperature. Up until Mariner 2, many scientists, including Carl Sagan, were of the opinion that the surface of Venus was likely temperate. Perhaps tropical by Earth standards, but nothing too severe. The ever-present clouds indicated lots of water. So there would be oceans. It would be a steamy, humid, tropical world. Spectroscopic observations from Earth indicated a high concentration of carbon dioxide in the atmosphere of Venus. Some of it would dissolve in the oceans. As Carl Sagan put it, Venus could be a world covered with oceans of seltzer water. This phrase stuck in my head when I first heard it as a child, since I had to figure out what "seltzer" meant. During the 1960s and 70s, the scientists studying Venus received vastly more information than humanity had ever known about the planet. But little of this trickled down to the popular consciousness. 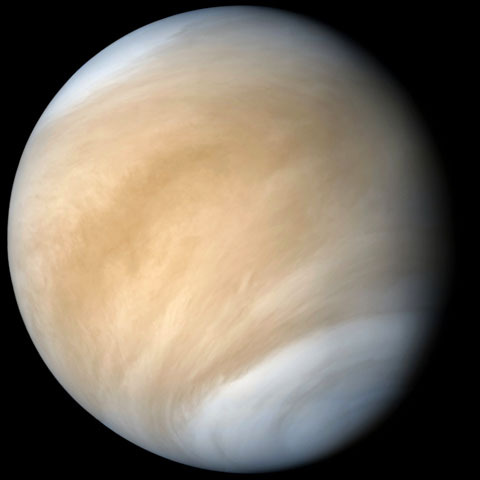 When I was a kid interested in planets in the late 70s, the stuff I could find in my local and school libraries tended to be a few years old, so to me Venus was still described as "Earth's twin". A tropical paradise planet where it might be nice to take a holiday. The reality is much harsher. The Russians found out the hard way. In competition with the USA during the decades of the Space Race, their space program invested in landing the first probe on Venus. Their Venera series of probes saw many failures, with several probes failing to reach Earth orbit, or experiencing operational failures in flight. The probes which never made it out of Earth orbit were not given official Venera names. Venera 1 and Venera 2 flew past Venus, but their instruments failed in flight and they returned no data. Venera 3 also failed in flight, but achieved a first by crashing into Venus in 1966, becoming the first human-made object to land on another planet. Venera 4 entered the atmosphere of Venus in 1967 and transmitted data successfully - until it was crushed by the immense atmospheric pressure of the planet. This was a surprise. Scientists expected the atmospheric pressure might be significantly higher than Earth's, but they had no idea just how much higher. The US's Mariner 5 probe also reached Venus in 1967. Rather than entering the atmosphere, it studied it during a flyby of the planet. 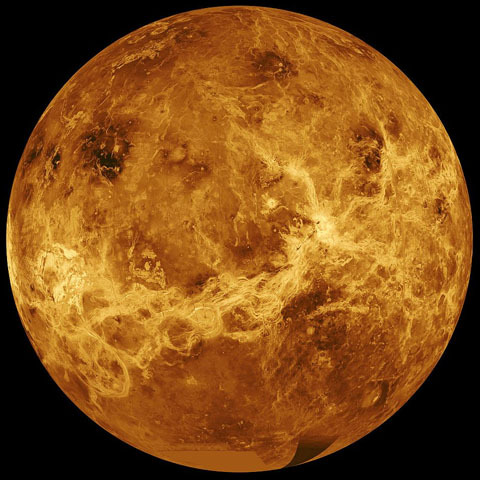 The data it returned, combined with the direct observations made by Venera 4, established that the atmospheric pressure at the surface of Venus was close to 100 times the sea level pressure on Earth. Unfortunately for the Russians, plans were already well underway for the launches of Venera 5 and 6, which were planned to land on the surface, but only built to withstand pressures up to about 25 Earth atmospheres. Pragmatically, they restyled the probes as "atmospheric probes" rather than landers. Venera 7, they completely redesigned so it would have a chance of surviving to reach the surface. It did so, and transmitted scientific data to Earth for a total of 58 minutes. It measured the surface temperature and pressure directly, returning figures of around 460°C (860°F) and 92 atmospheres - both figures higher than expected. Surface view of Venus by Venera 13. Public Domain image by USSR/NASA National Space Science Data Center. Venus was no tropical paradise. It was, to paraphrase Carl Sagan's description when the "seltzer oceans" view was dead, the closest place to Hell that we knew of. The Russians eventually landed Venera 9 on the surface, which for the first time was equipped with a television camera. It sent back the first photos of the surface of Venus, in fact the first photos from the surface of any planet other than Earth. Veneras 10, 13, and 14 also returned photos of the surface. Since these pioneering days of interplanetary exploration, NASA has sent the Magellan orbital mapping probe on a four year mission to map the surface of Venus using radar, from 1990 to 1994. The Magellan maps were like pulling back the covers of cloud from the planet, revealing details of the surface for the first time. This was only 20 years ago. This was when I was sitting in an observatory waiting to start my nightly observing run, while Vikki Meadows used the telescope to make observations of Venus. Her Ph.D. project combined the data from her own Earth-bound optical and infra-red observations with the hot-off-the-presses Magellan radar data that was still piecing together our first map of Venus. I went on to leave astronomy and pass into other fields after I graduated. Vikki Meadows continued into a successful career in planetary astronomy. She spent time working at NASA's Jet Propulsion Laboratory. She has led project teams working on planetary observations. Now she is a professor at the University of Washington in Seattle, and is working on NASA's EPOXI mission. The EPOXI spacecraft was originally used for the Deep Impact mission to study Comet Tempel 1 by hitting it with an impactor sub-probe. The spacecraft has now been repurposed to study planets. Not Venus, but planets outside our own solar system. And also Earth. EPOXI can observe Earth from afar and treat it is a foreign planet. Analysing that data is useful because we already know what Earth is like, so it validates the science findings when probes are pointed at other planets. I never got to study planets, but I'm pleased that I have a close personal brush with Venus. I haven't spoken to Vikki for many years, so I hope she'll excuse me for making her the backbone of this annotation. Every time I see that morning or evening star in the sky, I can feel that I was, if not involved, at least there for some of the discoveries we've made about that mysterious planet. When the sun is below the horizon, but not far below, its light still illuminates the sky a bit. This period of time is known as twilight. For optical astronomy, you want all of this light to be gone, which happens when the sun is about 18° below the horizon. The time this takes after sunset or before sunrise depends strongly on your latitude. In Europe and northern parts of America, it can last well over two hours. Where I live, it's more like one hour. The University of Sydney used to have both an Astronomy Department and an Astrophysics Department, mainly for historical reasons. Both did astronomy and astrophysics, but the Astronomy Department concentrated on stars within our Galaxy, while the Astrophysics Department mainly did extragalactic astronomy. The distinctions grew smaller over the years, until they amalgamated into the Sydney Institute for Astronomy. No Internet in those days! Initially only 35 minutes of data were properly received and analysed. A few weeks later, when the recording tapes were looked at more closely, they found an additional 23 minutes of data, recorded with a very faint signal. The probe had toppled on landing and its antenna wasn't properly pointed at Earth, so the signal trailed off tantalisingly into silence as the planets rotated. Last Modified: Tuesday, 28 January 2014; 22:17:16 PST.